We find in this week’s Torah portion, Parashat Shoftim, the command: “tzedek, tzedek, tirdof,” Justice, Justice, you shall pursue (Deut. 16:20). How appropriate that we read these words as we memorialize the words of Dr. King. The Hebrew is in the command form, in future tense, as a reminder that this commandment is never fully completed. We never finish pursuing justice, for full justice and equality still does not exist in our midst. I recently saw the movie, The Help, based on the book by Kathryn Stockett. This was an incredible tale of historical fiction and I have no doubt that it will be a strong contender in the Oscar race. It was a reminder of how far we have come and how we have evolved as a society, but also a sign of how far we still have to go. As long as there are laws in this country that aim at identifying, prosecuting, and deporting illegal immigrants through racial profiling, then we continue to pursue justice. As long as women in this country make on average on 76% of what men make for the same job, while doing the same work, then we continue to pursue justice. As long as an average of 17 million households, close to 15% of the country, are food insecure in this country, then we continue to pursue justice. As long as racism, sexism, homophobia, anti-semitism, discrimination, bullying, and hate still exists in this world, then we continue to pursue justice. 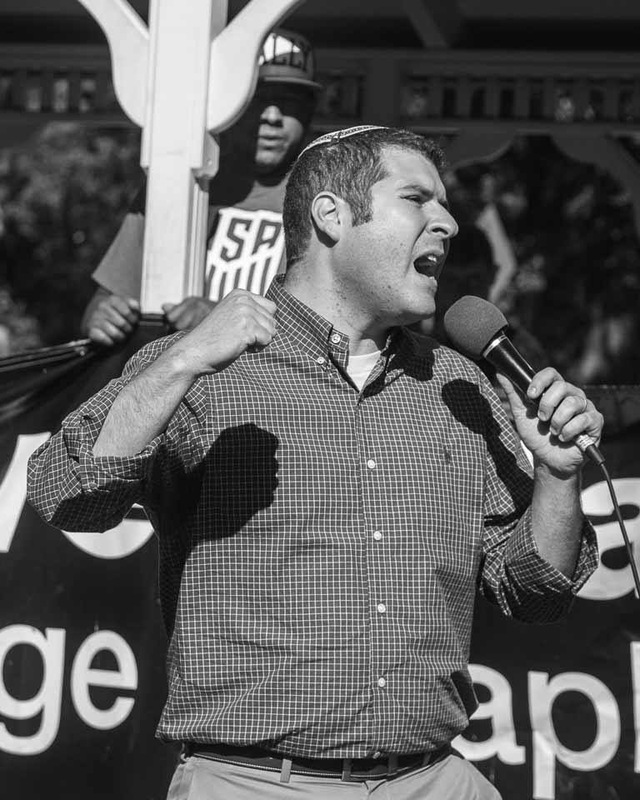 May we all continue to pursue justice, not just for our own sake, but for the sake of all those in this country — and in this world — whose voices are silenced. 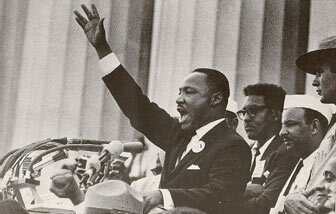 Like Dr. King, I too refuse to believe that the bank of justice is bankrupt. It is our job to let our voices be heard, to stand up for what is right, even if no one else is willing to do so. Justice, Justice we shall pursue. Surely then, we will live to see Amos’ prophecy be fulfilled. We may not see the day-to-day harm we cause to the environment. And the truth is, that earth will still be around long after we are here. But do we want to be the ones to destroy this planet? Do we want to be the ones who ruin this planet for our children? Or are we the ones to save the planet, to stem the tide, and to plant trees for future generations? Our world – GOD’S World – is in crisis. It is up to us to do something. The Jacksonville Jewish Center is one of just a few select Houses of Worship in this country that is a part of the GreenFaith Program. As a GreenFaith member congregation we are committed, over a two-year period, to showing that as a faith-based organization, we don’t just honor God through ritual, but we honor God by protecting the world that God gave us. We do this by more and more, using Compact Fluorescent Bulbs, limiting air conditioning and heating, limiting waste, limiting paper usage, expanding what we recycle here, and being an advocate – as an institution – for environmental concerns. As a GreenFaith congregation, we can do our part, and we are slowly, but surely dedicated to doing so, but we – as an institution – can only do so much. We all need to lessen our carbon footprint. We all need to unplug. The world is in our hands. We can continue to destroy it, or we can save it, we can repair it. We can recycle. We can replant. Just as our ancestors did for us, so too we must do for our children. As children swarm the aisles of stores and stock up on binders and books, pens and pencils, backpacks and lunchboxes, we tend to ignore the most important preparation that goes on in the days leading up to the beginning of the new school year. Teachers are spending their last days of “summer vacation” preparing lesson plans, setting up classrooms, and investing their own time, energy, and even money, for the sake of our children’s future. I know that the teachers at Martin J. Gottlieb Day School are busy at our preplanning week preparing for an incredible year of learning! I remember my second grade teacher Mrs. Einhorn. She introduced me to journaling and encouraged me to write daily. My very first sermon came in the form of pictures and misspelled words in a shiny purple spiral notebook thanks to her encouragement. Mrs. Einhorn made learning exciting to me as a seven year old. That is a teacher’s job. That is each of our jobs! As we read in this past week’s Torah portion, parashat Va’etchanan, and reaffirm daily in the Shema, v’shinantam l’vanecha, you shall teach them to your children. We are all obligated to teach our children. Formal and informal Jewish education takes place at camp, during Youth Group programs, on Shabbat in the synagogue, and at home. Yet, there is no greater opportunity to educate our children than when they are sitting in the classroom, full of energy and enthusiasm, hungry to learn. 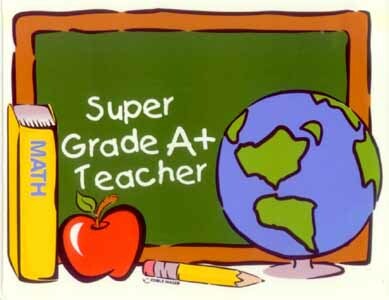 We thank our teachers for the amazing job that they have done and are about to do in molding our children for the future. The average salary for a teacher in the state of Florida is $50,180. The average salary salary for a Major League Baseball player is $3,305,393. Something is not right about these figures. Don’t get me wrong: I enjoy sitting in front of the television and watching a full nine-inning game, and I don’t mind paying a lot for great seats at the ballpark, but is our money truly being well-spent? It is time that we reinvest in education. Do we want our children’s role models to be overpaid athletes or inspiring educators? Do we want our children to look up to Alex Rodriguez or Mrs. Einhorn? Pirkei Avot, the Ethics of our Sages, teaches (1:6) that when one selects a teacher, one also acquires a friend. A teacher is a true friend, not someone who talks to you because you are wearing a certain article of clothing or are a part of the “in” crowd. A teacher talks to you because a teacher cares about YOU – the authentic you – and a teacher spends years helping students figure out who that authentic you is. Teachers bring the subject matter to life. They create a safe space for students to learn, grow, question, and challenge. They push those who need to be pushed and they comfort those who need to be comforted. A teacher is someone you can count on, someone that helps each student be the best person he or she can be, inside and outside of the classroom. Thank you to all of our teachers at the Martin J. Gottlieb Day School, the Bernard and Alice Selevan Religious School, and the JJC Preschool for what I know will be an incredible year. Todah Rabbah to all teachers for pouring sweat and tears into all that you do and fulfilling our greatest commandment, v’shinantam l’vanecha, teaching our children. In Tractate Yoma 9b, “Sinat Chinam” – senseless hatred – is listed as the reason for the destruction of the Second Temple. We brought it down ourselves — because of our hate, our distaste for the other, not just Jews hating other Jews, but human beings hating other human beings simply because of race, religion, or ethnicity, one hating another because of his likes or dislikes. Hate is a word used too much in our society. When children get mad at someone, they say “I hate you”. We too are guilty of this, I hate that idea or that activity or that sports team. We may not truly mean that we “hate” someone or something, but this is what our children hear. Rashi teaches that “Sinat Chinam – Gratuitous Hatred” is hatred directed towards individuals who have not committed any action for which it would be justifiable to hate them. I believe there are very few things in this world that one could do that would justify hating that individual. Most of the time, it is Sinat Chinam. Most of the time, it is a hate crime. I was saddened to read about the hate crime that took place in Jackson, Mississippi only days ago. A group of white teenage boys in two cars decided that it would be a fun evening activity to attack an African-American male. They pulled into the first parking lot off the highway, got out of the car, and two carloads of teenagers beat James Craig Anderson – 49 years old – to death. They ran over him with their car just to be sure. Such events are disgusting and sickening, especially when we consider that children learn such hate from parents, teachers, and friends. We end Tisha B’Av with a sense of hope: We chant the last words of Megillat Eicha, the Book of Lamentations, and ask of God to take us back, to once again bring us closer to the Divine. We distanced ourselves from God and in doing so, have allowed hate to invade our souls. As the ending of this saddening day nears, we see a sliver of light in the darkness. We cling to God, in hopes of removing the hate within us. Yet, we also have a responsibility to rid the world of all hate, not just within us, but within everyone. We learn in Pirkei Avot, the Ethics of our Sages, that “when we come across a place where there are no worthy persons, no good people, then we must strive to be good and to be worthy” (2:6). Ending hate begins with us. We must stand up against such hate crimes. Our children must stand up against bullying. We pray that in the not so distant future, we will live in a world full of respect, love, and admiration, regardless of race, ethnicity, sexual orientation, gender, class, or religion. I was once a vegetarian. Admittedly, this was not my choice. When I was in Middle School, my parents decided to become vegetarian. All of a sudden, we only have a dairy set of dishes in our home and I was forced into a corner. So, at age 12, I became vegetarian. I lasted as a vegetarian for over a year. It was a Friday night Shabbat dinner at summer camp, when some of my friends convinced me to take a bite of the Shabbos chicken. For those of you who’ve been to summer camp, you know the Shabbos chicken tastes more like a rubber chicken! Yet, after a year and a half without any beef or poultry, that rubbery, cold, undercooked camp chicken was delicious! I am a carnivore. I admit it. I enjoy eating meat. One would then think that the Nine Days of Av are challenging for me, but the opposite is true. From Rosh Chodesh Av, the beginning of the Hebrew month of Av, until Tisha B’Av, the ninth day of the month when we mourn the destruction of the Temple in Jerusalem, it is customary to refrain from eating meat (except on Shabbat.) We do not eat meat because it represents a worldly pleasure, something served at a meal of celebration or a simcha. We are spiritually and emotionally preparing for the saddest day on the Hebrew calendar, so we avoid such pleasures. Additionally, The meat that we eat is symbolic of the sacrifices offered to God in the Temple. Refraining from eating meat recognizes the gapping hole left in our religious tradition, ritually and ideologically, with the destruction of the Temple. Refraining from eating meat — especially if you are a meat lover like me — helps us to understand how much meat as a people we consume. With a staff of just 750, Empire Kosher Poultry ritually slaughters 240,000 chickens and 27,000 turkeys a week! This is just poultry; this doesn’t even take into consideration the amount of beef that is slaughtered for consumption in this country. That is a lot of meat, arguably too much meat! I am not preaching vegetarianism because I am not a vegetarian. I have no intention of becoming a vegetarian! My family continues to try to convince me to reverse course and go back to my herbivorous ways of middle school. I am suggesting though that we take advantage of these nine days without meat to reflect on how many animals are slaughtered, how much life is lost, so that we can eat and sustain ourselves. We take advantage of these nine days to consider that even if we eat meat, maybe we eat too much meat. We live in a wasteful society. Obviously for health reasons, leftover food on a plate at restaurants get thrown out. We too are guilty in our own homes by making too much food and then dumping the leftovers or letting them sit in the fridge until they go bad. We waste too much chicken and turkey and beef. If we are going to kill an animal, then we need to make sure we eat it, instead of wasting it. While we are at it, we also have the opportunity to praise God for the food on our tables, for being able to eat, grow, and live, even at the expense of another being’s life. Life is pleasantly slower in the south. As I continue to settle into my new home in Florida, many have asked, what is biggest difference between New York and Jacksonville? The short answer is that life is slower. Some may think that when life is slower, less gets accomplished. I would suggest that the opposite is true. Walking on the streets of New York, people were so busy to get to where they needed to go that they would run over anybody that got in their way. In Jacksonville, people slow down to greet someone on the street. We hold the door open for others instead of trying to squeeze through the door before it closes shut. We offer a hug and a handshake instead of a cold shoulder. Jacksonville is warm. I am not just talking about the temperature here in August! I mean that Jacksonville is a warm community, a community that welcomes people with open doors and open arms. This is certainly true about the Jacksonville Jewish Center as well as other Jewish communal institutions in Jacksonville.